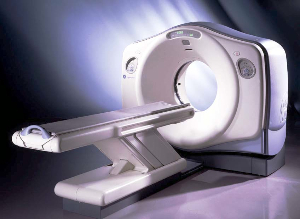 The GE Lightspeed Ultra 8 mobile CT scanner stands as one of the fastest 8-slice CT machines on the market. In fact, the Ultra 8 mobile CT is presented as a premium pediatric CT scanner because it delivers exams up to 3-times faster than a 4-slice CT scanner. As a third generation multi-slice helical CT Scanner, the GE Lightspeed Ultra 8 mobile CT features a 53 kW generator, 6.3 MHU tube, and a fast gantry rotation time of 0.5 seconds. This mobile CT also has an innovative solid-state Matrix detector that allows this mobile CT to simultaneously acquire multiple adjacent slices of the patient’s anatomy. The Lightspeed 8 was the first 8-slice scanner released to the market and was revolutionary in the domestic and international market. Its speed, low dose, and high resolution images make this a top-choice refurbished CT Scanner. We highly recommend the Lightspeed 8 Ultra as a used CT Scanner.